University College London (UCL) is the largest employer in Camden, and is one of the largest employers in Central London. With over 10,000 staff and a litany of students, it make a significant contribution to the local economy, features one of the UK’s best medical schools, and is known for its academic excellence worldwide. True to its cultural form, Camden is home to Getty Images, Emap, and MTV Europe. Getty Images is well known for protecting the artistic license of photographers and videographers worldwide, and often supplies photographs to major news outlets. Emap is known for producing a range of trade magazines, including the Nursing Times, Construction News, and Drapers. MTV’s presence in the borough makes it a particularly exciting destination for those with an interest in popular media, as the channel represents some of the world’s most exciting music, as well as hit shows like The Valleys and Geordie Shore. 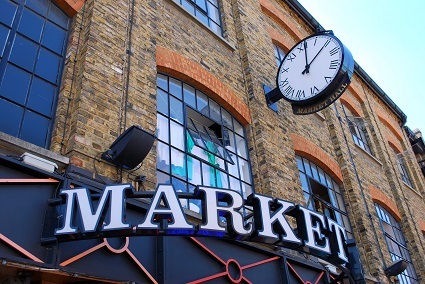 Self-employment and niche cultural industries continue to make Camden London’s fifth most popular borough for tourists. The local markets there are famous worldwide, although many have shifted from the traditional food and drink format to boutique stalls that cater to the desires of visitors. Compared to some London boroughs, renting office space in Camden isn’t too painful. In the northern parts of the borough, those looking for the most cost-effective office space can expect to pay around £30 per square metre. Averages for office space appear to reach around £60 per square metre, which still makes it a cheaper alternative to the City of London, with equally good transport links. It is rare for offices to be much more expensive than this in Camden, although some can reach into the 90s or even 100s if they’re located close to major employers and excellent transport links. Camden is well served by both the underground and the overground, with the busy Northern Line running through the centre. There are 12 rotating bus services that operate locally, but they are held back a little by the borough’s one-way system. Fortunately, there are plans in the works for introducing a two-way system to Camden, which should enhance transport connections. There has been an increase in cyclists in the borough, despite a lack of cycle lanes. Parking facilities are generally quite poor, with many residents choosing to rely on public transport instead. In addition to excellent transport links throughout the borough, Camden is home to one of the best workforces in terms of skills. The number of people with degrees is higher than average, which means you won’t have to compete too fiercely with other employers to choose an excellent employee from the local talent pool. As of 2009, 53% of people living in Camden had a degree, which is higher than the local average. Current predictions estimate that the local population is set to grow, which is good news for those operating in the retail sector. With this growth, it also looks as though there will be an increased number of people who are classed as ‘unskilled’, which means that high degree average may not last long. Ongoing projects in the borough are set to see significant investment in the local community. This includes projects like the Chalk Farm Project, which has been created to gift the local area a facelift. If you’re interested in working within close proximity to multiple service providers, or operating in a cultural hub, Camden is an excellent business destination for you. For further information on office space opportunities and availability in Camden click here.